When buying a used car in Virginia, get a vehicle history first. Checking the car’s report will reveal some critical information. It will show if a car has been in an accident or has an open recall. At VinCheck.info, you can get a free vehicle report by running a VIN check or license plate lookup. 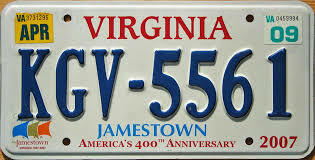 Before you can legally drive in Virginia, your vehicle must have license plates issued by the Virginia DMV. Vehicles are required to display license plates on both the front and back. Lost, stolen or damaged license plates can be replaced. Simply complete Form VSA 14 and submit to your DMV. If your plates have been lost or stolen, please report this to your local police department. Virginia title with the “Assignment of Title by Owner” and “Application for New Owner Certificate of Title and Registration” sections completed or, if the vehicle is new, provide the Manufacturer’s Certificate of Origin/Manufacturer’s Statement of Origin (MCO or MSO). If titling with an MCO or MSO, complete an Application for Title and Registration (VSA 17A). Have your car titled in Virginia. Virginia issues more than 200 special license plates which represent the military, colleges and universities, and other special interest organizations. Personalized license plates costs $10/year. You can use a combination of up to seven characters. Please check the availability of your personalized plate before you purchase. How much does it cost to transfer license plates in Virginia? Pay $2.00 for license plate transfer fee. How do I cancel my Virginia license plates? Have no outstanding tax obligations on your motor vehicle. Provide insurance policy information or pay the uninsured motor vehicle fee. Ask for the car’s maintenance record from the owner, dealer, or repair shop. Know the title status of the vehicle. It could be salvaged, rebuilt, has an outstanding lien, or flooded. Check for special purpose designations, if the vehicle was used by a rental or lease company, or serviced as a taxi. Confirm ownership of the vehicle. Avoid paying for a used car that is reported as stolen. Have the car inspected by your mechanic. Run a Virginia Free License Plate Lookup to uncover the full-story of your Virginia-registered vehicle.